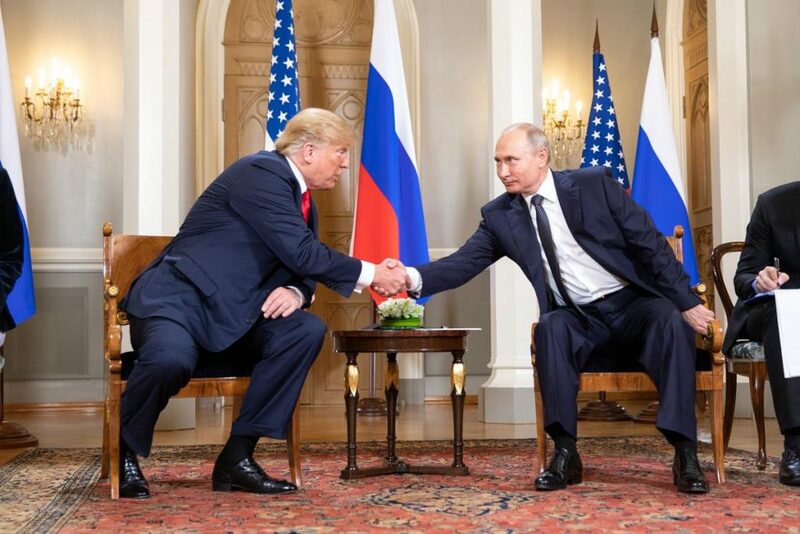 The Helsinki Summit – or the Treason Summit, as some call it – of the 16th of July, has come and gone. It left a smell of burning hot air behind. President Trump, opened the meeting by saying that up to now relations between the United States and Russia were bad, and confessing that the US was to blame for it. He wanted them to improve and hoped that this meeting – he indicated that others of similar nature may follow – may be a first step towards normalizing relations between the two atomic super-powers which together, he said, control 90% of the world’s nuclear destructive force. A timely admission, but ignoring the most dangerous and unpredictable atomic power, the rogue nation of Israel. If ever the promising dream-like sounds of Donald Trump of denuclearizing the globe were to see the light of day, Israel would have to be among the first countries to be de-nuclearized – which would be a real step towards world security and peace in the Middle East. During the later Press Conference, Trump though voicing his appreciation for the ‘fine’ secret services of his country, he admitted that he trusted more Putin’s word on Russia’s non-interference than that of his secret service, “why would they interfere?”, for which he was trashed at home by his adversaries, the MSM, the democrats and even the Republicans. Now, back home, Trump has to accommodate the public, telling them he mispronounced ‘would’; he really meant “wouldn’t”… a first rate spectacle of idiocy that, surely, after a while will go away, as everything does that has no solution, but gambles with dishonesty. There is no winning in the indoctrinated and brainwashed to the bones American public. It couldn’t be more obvious, how the media are rallying the American people for war with Russia. The greedy military needs war – and the economy of the US of A also needs war to boost her GDP, or rather for sheer economic survival. The topic of Russian interference in the 2016 Presidential Elections, will just not be dropped. After a zillion of proven false accusations, in a reasonable world it would fade away. Not in the US. It is a clear sign of the decline of the empire. It’s the desperate hopelessness of the naked emperor that speaks. So, they call Trump treacherous towards his country – a President who dares saying the truth publicly is called by the slimy Democrats and the yet slimier Republicans – and foremost by the mainstream media – a case for impeachment. There is an internal battle raging in the United States. It pulls the country apart. It’s the want of making America Great Again, by concentrating on internal production for local markets, versus the globalized aspirations – the drive for a dollar world hegemony and the full and total subjugation of the peoples and their resources of this globe. The latter will not be possible without an all-out war – and the elite doesn’t really want to live underground perhaps for years in protection of a nuclear fallout nobody knows how long it may last. Trump’s handlers are aware of the alternative, ‘building from within’. Is what Trump is propagating, “America First”, the right approach? – Maybe not, but the concept might be right, given the destitute state of the world, where sanctions and trade wars, also initiated by Trump, are creating havoc among former partners. A regrouping of nations, aiming at self-sufficiency and selective trading partners according to cultural and political similarities might bring back national sovereignties, abolishing the corporate globalized approach that has been doing harm to 90% of the people. WTO, the monster made by the west to further advance corporate power over the weak, should and would become obsolete. Trump’s contradictions are what defeats his credibility. He admonishes Madame Merkel for being enslaved by Russia for buying Russian gas instead of the US’s environmentally destructive fracking gas. “We put NATO in Europe to protect you from the enemy, Russia, yet you prefer buying Russian gas than dealing with those who protect you”. It didn’t occur to any of the European NATO halfwits to tell Trump that all that NATO has done so far is destroying countries throughout the Middle East and the world, and that they, the Europeans, have supported the US in their senseless destruction, creating a flood of refugees which now threatens to suffocate Europe. – There was nothing, but nothing about protection by NATO. If anything, NATO was an aggressive force, moving ever closer to Russia and flanking China on the eastern front. None of this was said, though, by the European NATO puppets. Trump then goes to Helsinki, meets Putin and says he likes him and he wants to be friends and make peace with Russia. – Of course. We all want peace. But who can believe him, when a few days before he accused Germany of playing into the hands of the enemy, Russia? Remember, a year ago at the G7 summit in Hamburg, Trump was shaking Putin’s hand and said ‘I like him’. At the recent disastrous G7 conference in Canada, which turned out to be a G6+1 summit, before running off to Singapore to meet North Koreas Kim Jong-Un, Trump dropped a little bomb, “why not converting the G7 again to the G8 and include Russia?” – He left the group stunned and speechless. – So, his drive towards improved relations with Russia is nothing new. It’s just not accepted by the warriors in Washington. 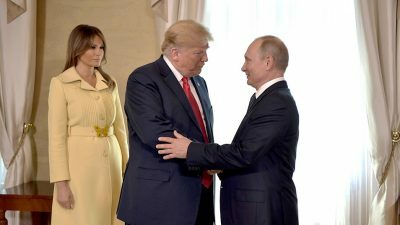 The Helsinki summit looked and sounded like a summer show – just to continue the attention deviation maneuvers of the World Cup that ended the day before in Russia. – What’s going on behind the scenes? – It’s one of those hot summers when nobody wants to think, just to be entertained, never mind the farces and lies – like during Roman Empire times – it’s the modernized Colosseum, adopted to the age of cell phones, tablets and micro-chips. The Colosseum is the all-so transparent veil that should shield the world’s eyes from the empire’s auto-destruction. Today’s gladiators are the peoples of entire countries, continents, slaughtered or made homeless by the millions, by teleguided missiles and bombs, causing the largest migration streams – by far – in modern history; 70 million worldwide and upwards are on the move. Generations without homes, education; generations without a future, drifting across the seas in desperate hope of survival. Mr. Putin’s words in Helsinki were words of wisdom, propagating peace as a good thing and dismissing Russian interference in the American elections. Not even discussing the re-inclusion of Crimea. Period. He could have mentioned, instead, the hundreds of elections and regime changes that Washington initiated, manipulated and manufactured around the globe within the last 70 years alone, but he didn’t. Wise man; non-aggression. It is obvious, the “muttonized” world of Americans and European vassals don’t even think that far anymore. For them it’s natural that the ‘exceptional nation’ does what she wants with impunity – but the same rights wouldn’t apply to others. President Putin handed Trump a list of steps and actions to consider to embark on a denuclearization process. Trump and those of the deep state elite who’s love for life is too great to risk a nuclear war, may just take advantage and do something about it. The enigma Trump is perfect for the Deep Dark state – he is a roller-coaster of confusion and contradictions. To the NATO members, at the recent Brussels NATO summit, he ordered “pay up, or else’’ – which could mean, or we pull out of NATO. Though that is the desire of a large majority of Europeans, for Trump it’s a contradiction, as he pretends that NATO is supposed to defend Europe against her arch-enemy, Russia. But, then, in turn, Mr. Trump moves on, courting this very “arch-enemy’’, by responding to the peace bells Mr. Putin has been offering ever since he came to power, never a negative word against Washington, calmly calling the demonizers ‘our partners’. Confused people can easily be taken off-guard and manipulated. Who knows what the real agenda of the Trump handlers has in store. Trump’s bold statements on the side of President Putin, will make his demonization at home easier. Though the people at large clearly want peaceful relations between the two nations; everybody fears war, but they will continue to be indoctrinated by the CNN-NBC-BBC’s of this world. Let’s face it, after the collapse of the Soviet Union, there was and is no reason to make Putin and Russia America’s enemy. But Putin’s assertiveness in bringing Russia to the fore and onto the world stage again, was a good reason to upset the self-appointed Uni-Power, US of A. The US super-power lives of wars, and this lifestyle requires enemies. Russia and China are ideal, as they control huge land masses with almost unlimited natural resources. They have done nothing of what the mainstream accuses them of. And if the President of the United States annuls the key enemy, turning him from foe to friend, such a President becomes a liability for the swamp of Washington – a liability, indeed – “or else”.